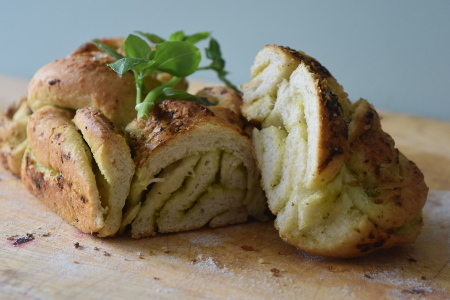 If you’re looking for bakery that’s both homely and will impress guests, then this braided vegan pesto bread recipe is for you! With pretty pesto layers that deliver in flavour as well as appearance, this bread works as an impressive centrepiece and still holds its own as a tasty snack: yum! I’ve adapted my pesto recipe from Minimalist Baker’s recipe – her pesto recipe is beautifully balanced and produces a spreadable pesto, perfect for creating the layers in this recipe. I use the same recipe for my pesto pizza on which the pesto works equally well. 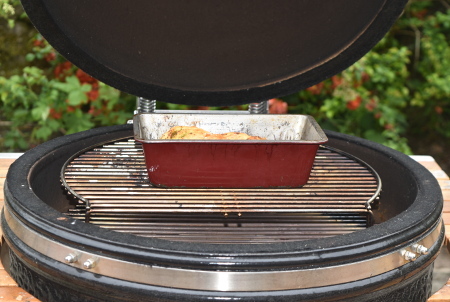 As with quite a few of my recipes, we’ll be using the barbecue as an oven to bake our vegan pesto bread – if you’re using a ceramic barbecue, then you’ll need heat deflector stones in between the charcoal and the grill, as well as a 2nd tier grill grate to pop your loaf tin on. You will also of course need a barbecue with a lid. Makes a small-ish loaf of vegan pesto bread that serves 4-6 people as a side dish. Prep time (including proving time): 1 hour 45 minutes. Cooking time: 30-40 minutes. After you’ve added all the water, use your hands to push in the remaining flour and combine until you have a not-too-sticky ball of dough. Of course, if the dough is really sticky then go ahead and add more flour, whereas if the dough feels dry and isn’t sticking together well, add a touch more water. 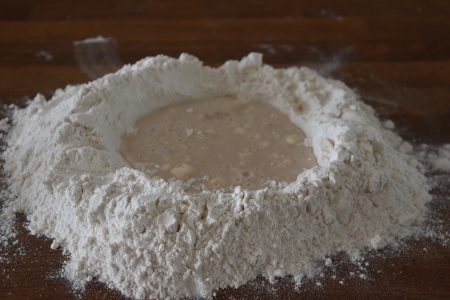 Pop the ball of dough into a large bowl and cover with cling film, before putting it in a warm place to proof. I use the plate warming drawer of my oven which seems to work well enough, as long as you keep it on a low temperature. Leave it for around 45 minutes, until doubled in size. In the meantime, it’s time to make the pesto! This only takes a few minutes though, so you’ll have time to do the washing up before the bread has finished proving! Simply put all of the ingredients into a food processor or high speed blender and blitz! Taste the pesto, and add more of any ingredient to your taste: if it’s too sharp, try adding some more nuts; if you want a more intense overall flavour, add a little more salt and if you want a more sharp or tangy flavour, add some more garlic or lemon juice. 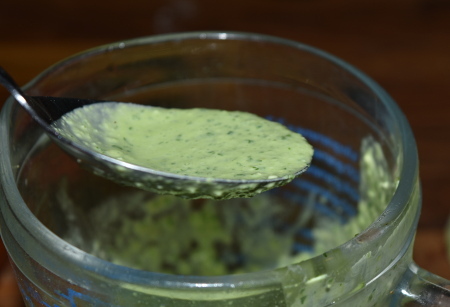 The pesto should also be a spreadable consistency – if it’s too solid, add a little more olive oil or water. If it’s too runny, add some more of the solid ingredients. The most important thing is that you’re able to spread it evenly across your dough. 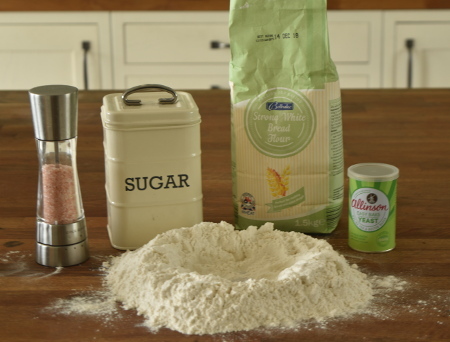 Once your dough has doubled in size, take it out of its warm place and roll it out onto a floured work surface until it's about 0.5cm thick – it’ll make your life easier if it’s as close to a rectangular shape as possible. Spoon the pesto out onto the dough and use the back of your spoon to spread the pesto evenly across the dough, corner to corner. Starting at one of the short ends, roll the dough up into a chunky sausage. Try to roll it as tightly as possible without all of the pesto oozing out – but if a little pesto does escape, you can always spread it back over the top! Using a sharp knife, cut the dough sausage lengthways into three strands. 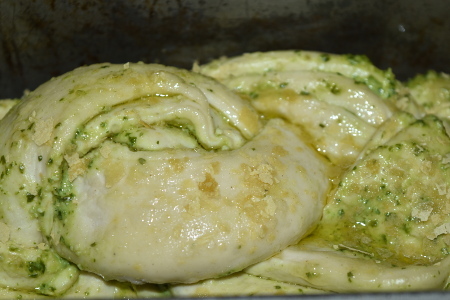 Braid the dough (bring the left strand over the middle strand, then the right strand over the middle strand, and repeat) until the whole length of the pesto dough has been plaited. Pop the dough into a greased baking tin (10 inch or 30cm tin will do just fine) and put it back in a warm place to proof for a further half an hour. At this point, light the barbecue and bring the temperature up to 180°C (356°F). Don’t forget to put in your heat deflector stones and 2nd tier grill! After your vegan pesto bread has finished proofing, brush it lightly with extra virgin olive oil and sprinkle it with rock salt (this is optional). Then pop it straight onto the 2nd tier grill of your barbecue and close the lid. Leave to bake for about 30 minutes, or until golden brown. 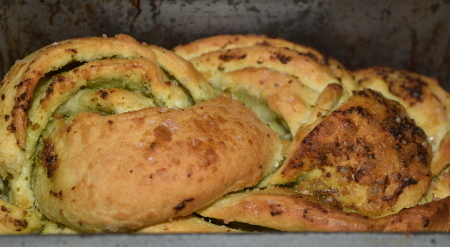 Your vegan pesto bread is ready to serve! It’s delicious on its own, or dipped in some extra virgin olive oil. Enjoy! Just spread the garlic butter onto the dough as you would the pesto, and spread any leftover garlic butter over the top of the bread instead of olive oil!